San Diego Comic Con has been going on these past few days. Coffee With Kenobi posted on their blog a video of the Star Wars Panel. It was great. I have never really followed any Comic Con very much, but I do know that SDCC is a very popular event. Ever since Star Wars Celebration in Anaheim I have been eager to see more interviews with JJ Abrams and Kathleen Kennedy, as they are behind it all. JJ Abrams is starting to impress me a bit, I am a little skeptical mostly because of how much he changed the world of Star Trek with his movies. But hearing him have so much respect for the fans, and the story itself is very redeeming for me. Also back at Star Wars Celebration hearing him say he has taken some steps back from CGI and going more the original route is great, it allows a more natural filing style. And to top it all off he invited everyone, all 6,000+ to a concert even more impressing. The panel itself was bigger than I expected it to be. 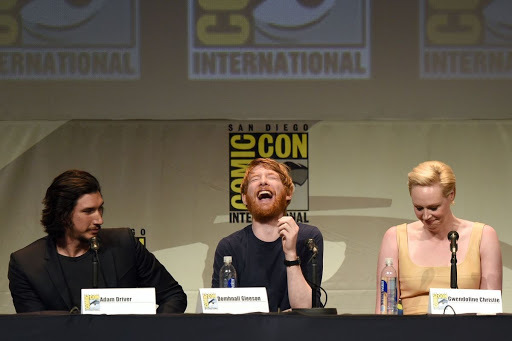 after seeing Daisy Ridley, John Boyega, and Oscar Isaac, they are considered the good guys, it was great to meet some of the Dark Side, Adam Driver, Gwendoline Christie, and Domhnall Gleeson. Why? well the whole star wars universe is based on the Light vs Dark side of the force, and seeing more dark side actors for me was a plus. I just hope these characters are up to the task, there have been some great dark side characters portrayed in the movies, Darth Maul, Count Duku, and of course Darth Vader. So i hope these actors are up to the task of playing a live action dark side character. It was great to see Mark Hamil and Carrie Fisher again, I always enjoying seeing them talk. I found it great that Mark openly admitted that he flunked a Star Wars quiz. The cherry on top was Harrison Ford! Seeing him walk out on stage was awesome! He isn’t the biggest fan of these events so to see him come on stage was jaw dropping. I think he is excited for this as well. 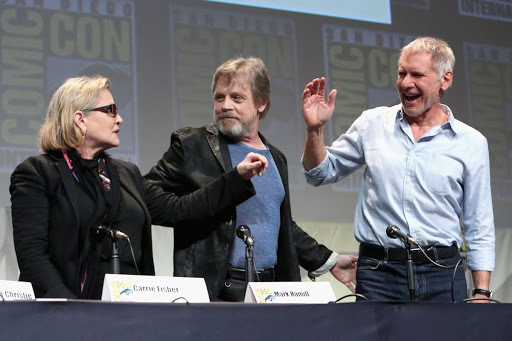 Seeing Han, Luke and Leia all together brought back fond memories of watching the movies I think i may have to do my annual movie-thonof the star wars movies, perhaps when my kid is born I will get them started on the right foot. Harrison stole the show, fans were so ecstatic about seeing him and asking questions.